From Goodreads ~ Thanksgiving had always been Ali Berg's favorite holiday ... but this Thanksgiving would be very different than any from her past. This year, Ali spends the holiday alone in a mountain cabin, reflecting on her life since losing her husband and young daughter ten months earlier. When Ali’s seemingly idyllic life is suddenly and irrevocably changed, she struggles to understand her anger and her shame and looks for a way to ease her grief and rebuild her life. Much to her surprise, the search for a future leads back to her past. A stormy night, a classic movie and a vivid dream combine to provide Ali with the desire to recall and reclaim relationships with significant friends and mentors from years gone by. She begins to wonder, did I ever tell these incredible people what a positive impact they had on my life? Did I ever thank them? Determined to express her gratitude (however belated) Ali decides to write each of them a personal letter of appreciation. Driven by an overwhelming desire to deliver these special thank you notes herself, she makes the courageous decision to undertake a year-long, solo road trip across America. Anchored and empowered by the unfailing love of her parents, siblings and best friend, Ali forges ahead. Her journey takes her to destinations as diverse as a small farm in eastern Washington, a heliport in Montana, a speakeasy in Nebraska, and a prison in New York. Along the way, she gains new, and sometimes unsettling insights about herself, her late husband and what it takes to survive the loss of a love. Ali's husband, Isaac, and daughter, Zoe, were killed in a car accident in February 2012. Ali was grieving their loss but she was also angry with Isaac for texting while he was driving, which attributed to the accident. In November 2012, Ali spends Thanksgiving alone and decides to show gratitude to those who have made a difference in her life. She writes each a letter and decides to spend the next year hand delivering them starting in January 2013. Some are to her family, some to friends she hasn't seen in years, another is to Isaac's sister, another is to her piano teacher when she was a child, etc. 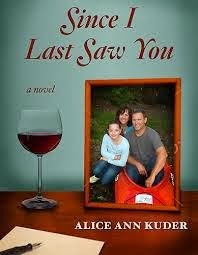 This book is her journey of delivering the letters, discovering America but also getting over the pain and loss of her husband and daughter. This is the first book I've read by this author (I believe it's her first one) and I liked it. I thought it was an interesting story and I liked the writing style. It is written in third person perspective but we also get to read Ali's diary as she writes in it (this is in first person perspective). I wasn't crazy one aspect in the end of this book, though, with its hint of where things could go in the future for Ali ... I found it a bit too convenient and tidy. I liked the characters and found them believable and likeable. Ali, her friends and her family have faith in God ... as such, there is no swearing and they refer to God often. I liked the overall message of the book ... appreciate the people who are in your life or have been in your life and the value they added. I don't think I would like the third person style.